• Jon Heyman of CBS Sports reported on Friday that the Pittsburgh Pirates intend to extend a $15.3-million qualifying offer to free agent Russell Martin. Coming off one of his finest big league seasons, the Canadian catcher reportedly declined a multi-year offer by Pirates during the regular season and is likely to earn a lucrative, multi-year deal on the open market. Heyman mentions the Los Angeles Dodgers, one of Martin’s previous teams, as a likely suitor. • I just received a notice that Andre Dawson will be signing autographs for the Fergie Jenkins Foundation at the Toronto Sport Card & Memorabilia Expo that will take place from November 7 to November 9. During his prime with the Montreal Expos, Dawson was a five-tool player, but he also boasts an underrated, sixth tool – excellent penmanship. Nobody signs a nicer autograph than “The Hawk.” Google “Andre Dawson autograph” and you’ll see what I mean. • Two of the finalists for the Minnesota Twins managerial position have Blue Jays links. Among other candidates, Paul Molitor, a designated hitter with the Jays from 1993 to 1995, is in competition with ex-Jays coach Torey Lovullo. Current Blue Jays bench coach DeMarlo Hale was interviewed, but Bob Elliott of the Toronto Sun reports that Hale is no longer in the running. • The San Diego-Union Tribune reported on Friday that Sean Berry, a member of the 1994 Montreal Expos, will not return as the San Diego Padres minor league hitting coordinator. Berry, who played three of his 11 big league seasons in Montreal, had been a coach in the Padres’ organization for four years. Prior to that he had served as a hitting coach with the Houston Astros. • In case you missed it, the Texas Rangers declined the $13.5-million option on former Jay Alex Rios’s contract for 2015 last Wednesday, opting to pay him a $2-million buyout instead. Rios slumped to just four home runs in 2014 and finished the season on the disabled list with a thumb injury. The buyout concludes the seven-year, $69.835-million deal that Rios signed with the Blue Jays in April 2008. Just 17 months after the ink dried on that agreement, the Blue Jays placed Rios on waivers and his contract was assumed by the Chicago White Sox. He played parts of five seasons in the Windy City before being dealt to the Rangers on August 9, 2013. In 11 big league seasons, Rios has hit .278 and has 165 home runs. • Thirty-two-years ago today, Jim Henderson was born in Calgary, Alta. Originally selected by the Montreal Expos in the 26th round of the 2003 MLB amateur draft, the 6-foot-5, 220-pound right-hander spent parts of 10 seasons in the minors before making his major league debut with the Milwaukee Brewers on July 26, 2012. Henderson pitched effectively for the Brewers that season, posting a 3.52 ERA in 36 games prior to unseating fellow Canadian John Axford (Port Dover, Ont.) as the Brewers closer in 2013. The Canadian hurler pitched in 14 games in 2014 before he was sidelined by a shoulder injury. • Victoria, B.C., native Michael Saunders has been named the recipient of the 2014 Al “Moose” Clausen Community Service Award by the Seattle Mariners RBI Club. This honour is handed out annually to a member of the M’s organization who has made significant contributions to the community. Saunders, whose mother passed away from cancer in 2011, has been involved with the Fred Hutchinson Cancer Research Center and Major League Baseball’s “Going To Bat Against Breast Cancer” initiative. He also participates in the Mariners Caravan in the off-season, talking with elementary school students about education and staying drug-free and serves as a spokesman for the Refuse To Abuse(r) anti-domestic violence public service campaign. Saunders will be presented with the award at a ceremony on November 15. • This week’s trivia question: Who is the only Canadian to hit a home run in their first World Series at bat? Please submit your answer in the “Comments” section below. The first person to answer the question correctly will win a 1981 Topps Tim Raines rookie card. Congratulations to Saunders. Great efforts. When healthy this year he did well. Gotta stay healthy. I think Rios is one of those players with amazing talent, but doesn’t always try hard. Thanks for the comment, Scott. I’m with you on Rios. 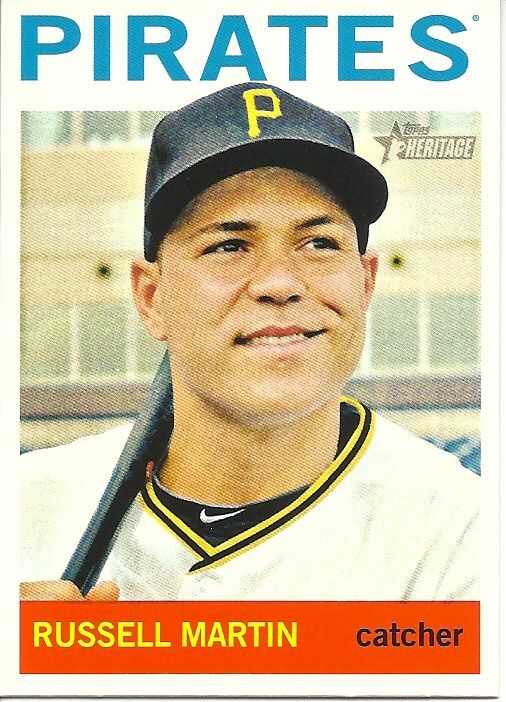 How long is the 15.3 million offered over for Russell Martin? One year, Devon. Thanks for the comment. You’re correct, Len. I have your address on file. I’ll send the Raines card out to you. Thanks again.